Let me tell you an interesting story about what happened to me on a recent Seabourn cruise through the Caribbean. We stopped in Barbados, and I disembarked and went straight to the cruise terminal. Now, the cruise terminal in Bridgetown is great – not only can you get free Internet access, but there are wonderful shops selling everything from Caribbean specialty rum cakes – to jewelry. There, I discovered a jewelry line that practically leaped out at me from inside the glass case: the designs of Lauren G. Adams. I spotted this ring – a beautiful eternity band, made all the more unique by the faceted charm attached to it. Now, we’ve ALL had charms on bracelets – but who puts them on rings? Lauren G. Adams does. And the designs are gorgeous! So gorgeous that the brand recently won three awards from a prestigious jewelry trade magazine. The brains behind the brand is Orly Ovadia, a jewelry designer who named her company after her three children. Orly believes that every woman should have the opportunity to dress like a million bucks – without spending top dollar. Her designs definitely do that. The ring that I spotted in Barbados was a mere $70 and my dear husband was only too happy to buy it for me. But when I wore it later that night on the Seabourn cruise, EVERYONE noticed it and commented on what an unusual piece it was. I was as thrilled in more ways than one. It makes a statement, and so unusual that other women will certainly swoon over it. The other unusual thing about Lauren G. Adams designs is that you’re likely to spot them where I did – in vacation areas such as the Caribbean. “It’s sold in stores that typically only sold gold and silver,” Orly explains. “But it’s proven to be a great addition.” She’s right. You’ll find Lauren G. Adams jewelry designs in high-end jewelry stores, but they are definitely affordable, so you can buy several pieces as souvenirs. And I’ll tell you something else – every piece comes beautifully packaged in a signature small shopping bag, and in a hot-pink drawstring bag bearing the designer’s name. If you need a special souvenir for yourself – or someone you really like – this brand makes an impressive impression. Besides the ring I bought, I’m in love with some of the other pieces. Take this pink-enamel ring, for example. 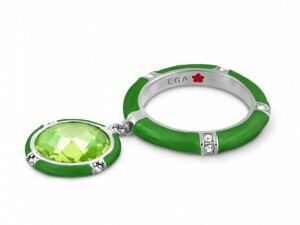 Stackable bracelets are another facet of this jewelry line. There are a wealth of enamel stackable bangles, with charms, which come in a wealth of colors. Adorable. This rose-gold bracelet is probably the most expensive in the line – and the most gorgeous. It’s so stunningly beautiful that it would definitely merit some starlet wearing it to the Oscars. The signature look of Lauren G Adams jewelry is bright color and graceful prints brought to life in high quality enamel and metal. The designs are always feminine with an urban, edgy twist on classic aesthetics; rich ornate patterns are paired with texture and movement to create Orly’s original themes. It’s all about the details! The beauty of Lauren G Adams jewelry is not only on the surface. The inside of each piece bears a unique finish, it may be cutout or enameled, and every piece is marked with the signature LGA Daisy. Well-made, high-end, first-class jewelry fashion at an affordable price — what more could you want? I’m also wild about these champagne drop enamel earrings — I know these will be my go-to gems. So ladies – make sure to stash Lauren G. Adams in your Samsonite carry-on – you’ll look like a million dollars at your destination – and won’t have to worry about placing your jewelry in the hotel safe.